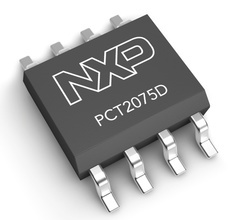 A new CMOS I2C-bus temperature sensor, PCT2075 is offered in a number of different packages to fit any design requirement. BC847S Fairchild Semiconductor BC847 is a Hybrid Transistor. BC857S Fairchild Semiconductor BC857 is a Hybrid Transistor. FFB2222A Fairchild Semiconductor FFB2222 is a Hybrid Transistor. FFB2227A Fairchild Semiconductor FFB2227 is a Hybrid Transistor. FFB2907A Fairchild Semiconductor FFB2907 is a Hybrid Transistor. FFB3904 Fairchild Semiconductor FFB3904 is a Hybrid Transistor. FFB3906 Fairchild Semiconductor FFB3906 is a Hybrid Transistor. FFB3946 Fairchild Semiconductor FFB3946 is a Hybrid Transistor. FFB5551 Fairchild Semiconductor FFB5551 is a Hybrid Transistor. FMB100 Fairchild Semiconductor FMB100 is a Hybrid Transistor. FMB200 Fairchild Semiconductor FMB200 is a Hybrid Transistor. FMB2222A Fairchild Semiconductor FMB2222 is a Hybrid Transistor. FMB2227A Fairchild Semiconductor FMB2227 is a Hybrid Transistor. FMB2907A Fairchild Semiconductor FMB2907 is a Hybrid Transistor. FMB3904 Fairchild Semiconductor FMB3904 is a Hybrid Transistor. FMB3906 Fairchild Semiconductor FMB3906 is a Hybrid Transistor. FMB3946 Fairchild Semiconductor FMB3946 is a Hybrid Transistor. FMB5551 Fairchild Semiconductor FMB5551 is a Hybrid Transistor. FMB857B Fairchild Semiconductor FMB857 is a Hybrid Transistor. FMBA06 Fairchild Semiconductor FMBA06 is a Hybrid Transistor. FMBA14 Fairchild Semiconductor FMBA14 is a Hybrid Transistor. FMBA56 Fairchild Semiconductor FMBA56 is a Hybrid Transistor. FMBS5401 Fairchild Semiconductor FMBS5401 is a Hybrid Transistor. FMBS549 Fairchild Semiconductor FMBS549 is a Hybrid Transistor. FMBS5551 Fairchild Semiconductor FMBS5551 is a Hybrid Transistor.